Karen M. Kedrowski is the new director of the Carrie Chapman Catt Center for Women and Politics. Photo by Blake Lanser. "Perfect equality of rights for women – civil and political – is the demand of yours truly." As I write this note of introduction in my new office, I sit beneath this framed note, which is written on National American Women’s Suffrage Association letterhead. Also in this room are framed photographs of suffrage leaders. Carrie Chapman Catt is indeed one of them. The Catt Center is in many ways the legacy of these powerful, visionary women. 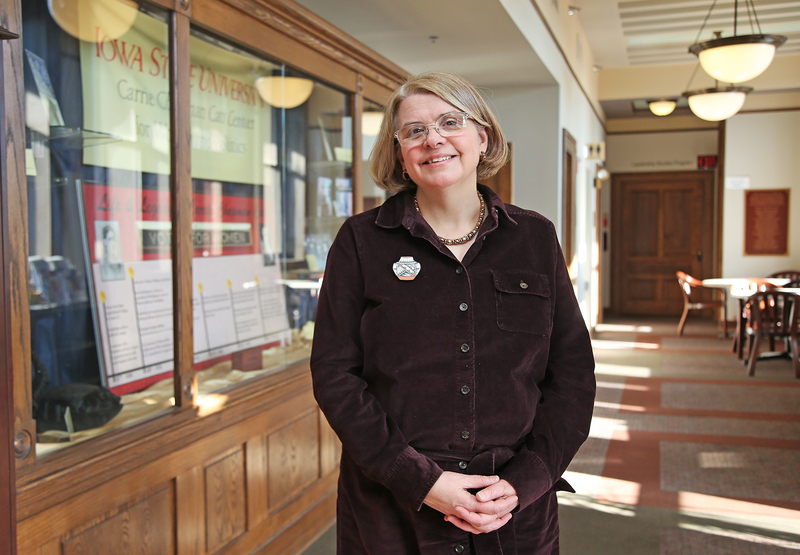 I am honored to introduce myself as the new director of the Carrie Chapman Catt Center for Women and Politics to the Iowa State University community and to the alumni, friends and donors who have supported the Catt Center for nearly three decades. I grew up in central Minnesota on a small farm outside of Little Falls. My interest in women in politics was piqued as a sophomore at the University of Minnesota when I took a course in the subject with Virginia Gray. While I focused on the U.S. Congress as a graduate student at the University of Oklahoma, women’s issues were never far from my mind. After I earned my Ph.D., I worked as a health policy analyst for Families USA, a nonprofit lobbying firm in Washington, D.C., where I developed a career-long interest in health policy. When I became a professor at Winthrop University, my diverse academic interests – women’s issues, health policy and Congress – merged into my research on breastfeeding policy and breast cancer activism. Civic engagement is also a passion of mine. As the director of the John C. West Forum on Politics and Policy, I led Winthrop University’s efforts to encourage students to become active citizens. This included intentional voter registration, turnout efforts and the creation of the NEW Leadership South Carolina institute, a program that encourages college women to consider careers in public service. Moreover, I led Winthrop’s efforts to capitalize on the early South Carolina presidential primary in 2016 by bringing 10 U.S. presidential candidates to campus. As the new director of the Catt Center, I intend to continue all of its successful programs. I especially look forward to my first Mary Louise Smith Chair lecture by Florence Graves and my first Ready to Run Iowa workshops for this spring. I am currently evaluating proposals for the 2019 Catt Prize research award, and I intend to continue to cultivate prospective donors who wish to invest in the Catt Center’s projects and students. As for new initiatives, I look forward to the Catt Center’s role celebrating the centennial of the 19th Amendment’s ratification. I am working with other Iowa leaders to plan a statewide celebration of this landmark and of Mrs. Catt’s contributions to the movement. The centennial coincides with renewed interest in ratifying the Equal Rights Amendment, which also provides another opportunity for educating students about women’s history. Finally, I look forward to collaborating with leaders on and off campus to capitalize on the 2020 Iowa Caucuses by encouraging student engagement in the caucuses and the general election thereafter. Director Emerita Dianne Bystrom left big shoes to fill, to be sure. However, she also provides a model for success that, with my colleagues here at the center, I seek to emulate. Moreover, I will look to the suffragists for inspiration as I too seek “perfect equality for the rights for women” both here and abroad. You can reach me at karenmk1@iastate.edu or 515-294-4185.